Rumpke Consolidated Companies is the largest private waste company in the USA and the No. 4 in the nation. 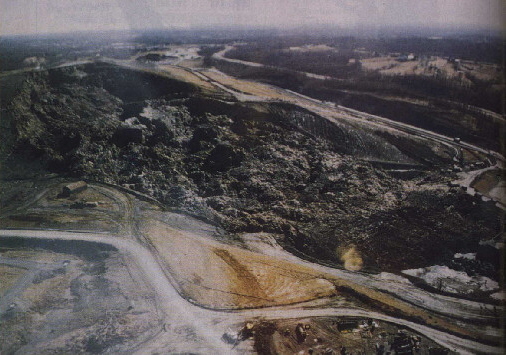 In Colerain, a township close to Cincinnatti (Ohio) the enterprise operates Rumpke Sanitary Landfill, one of the so-called Mega-landfills in the Midwest. Established in 1945, 1,6 Mio. t of municipal solid waste are disposed every year. Currently an dumping area of about 30 ha (120 acre) is in use, located north-west to an grandfathered area of about 54 ha. The grandfathered area has been destroyed by a slope failure on March 9,1996, when 1,2 Mio. m3 waste were sliding down. The grandfathered part of the landfill elevates 75 m high above the original ground. The North-west slope, where the landslide occurred, had an average slope ratio of 1:2,6. 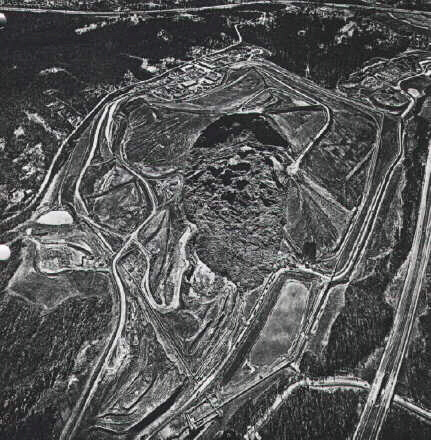 The landfill had no gas extraction. For leachate drainage not more than surrounding ditch at the toe of the slope has been constructed. 18 monthes before the failure, the original ground along the North-west slope has been excavated 42 m deep to prepare an expansion area. The slope down to the hole was 1:2,3. Additionally in October 1995, the toe of the slope was cut vertically 2,5 m high in order to get space for an access road. . On March 4,1996 local staff recognized small cracks through the covering Earth material at the crest of the slope. 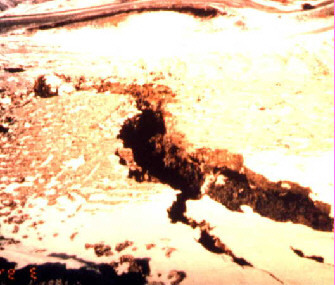 Initially, the crack were identified as a result of common landfill settlements and were stuffed. But the following days the cracks showed up again and again. Till the morning of March, 9 the cracks had been expanded up to the toe of the slope. Horizontal movements of the toe of the slope indicated the the entire slope was going to move. Around 11 A.M. the to of the slope had moved 3-5 m away, the cracks meanwhile opened up to 1 m. Close to noon, more cracks opened and black leachate was spurting out under high pressure. At noon, the entire slope started to move and within 5 minutes 1,2 Mio m3 waste were sliding out of an landfill area of 5 ha 360 m downhill. A shell-shaped vertical wall, up to 60 m high with an extent of 300 m was the left-over.